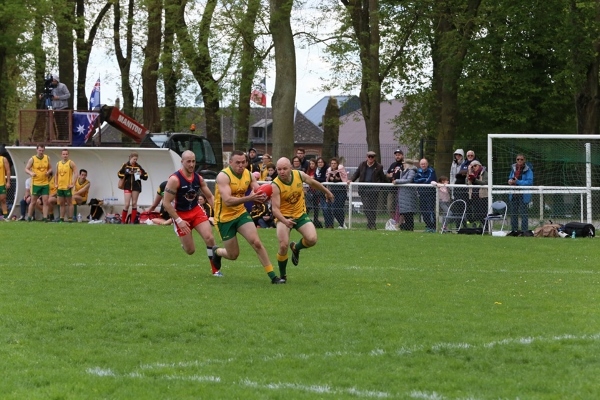 The match will take place on Saturday the 27thof April, although there will be a constant Australian presence in the town from earlier in the week – starting with the ANZAC Day Dawn Service held at the Villers-Bretonneux Australian National Memorial on Thursday the 25thof April. The build-up to the match will also include the players spending time with their host families, delivering AFL clinics to students, visiting memorials and marching through the centre of town prior to the match. This is guaranteed to be a special week for all of the players, umpires and officials as they honour the Diggers and the sacrifices made over 100 years ago. Players putting on the Australian Spirit jumper have been selected for this match by their connection to World War I, the Western Front and particularly, the Battle of Villers-Bretonneux – not their playing ability. In 1918 the town of Villers-Bretonneux was captured by German forces, however, overnight Australian troops rallied together and reclaimed the town on the 25thof April 1918. This moment in history has never been forgotten by the people of Villers-Bretonneux and each year they open their homes to Australian players as both nationalities reflect on what transpired over 100 years ago. 2018 Australian Spirit Captain’s present His Royal Highness, The Prince of Wales, with a special present ahead of his 70th Birthday following the dawn service in Villers-Bretonneux. John McClusky, Head of National Australia Bank in London said he felt proud that their London Branch continues to support AFL Europe.